How Useful is Pietism for Today’s Christians? That’s one of several questions about Pietism raised in a special issue of The Covenant Quarterly, a publication of the Evangelical Covenant Church (ECC) and its seminary, North Park Seminary. The issue — guest-edited by Bethel University faculty members Chris Gehrz and Christian T. Collins-Winn — is technically the August/November 2012 issue, but it’s just now hitting subscribers’ mailboxes. About half of its content is drawn from a 2012 Colloquium on Pietism Studies, held at and sponsored by Bethel University. (See my coverage of this event here and here.) 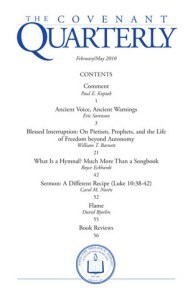 Regular readers of The Search for Piety and Obedience will know that I participated in a roundtable discussion at that colloquium, centered on the question, “Does Pietism provide a ‘usable past’ for today’s churches?” My response to that question — and the responses of my fellow panelists — is included in this special issue. You can read more about each of these papers, and the roundtable on Pietism’s “usefulness,” at The Pietist Schoolman. I hope readers of this blog will consider purchasing and reading a copy of this issue of The Covenant Quarterly. Like the Brethren in Christ, the ECC is a denomination shaped by the Pietist impulse within North American Christianity. And like the Brethren in Christ, the ECC continues to wrestle with the contemporary implications of this aspect of their theological heritage. What does Pietism offer to today’s Christians? How can its strengths empower our mission and vision? And how can its liabilities be moderated within our churches? These are questions I wrestled with in a recent article on Pietism in the Brethren in Christ Church’s In Part magazine. And they are questions that ECC leaders like Gehrz and others are continuing to ask in their own contexts. It seems to me that the Brethren in Christ could be greatly enriched by increased contact with denominations like the ECC. They might help us to re-imagine the significance of Pietism to our community today.